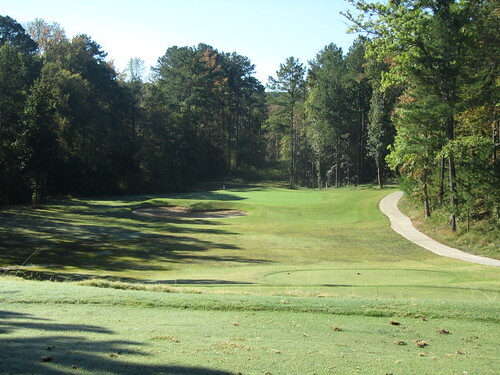 Bentwater Golf Club is located in Acworth, GA, about 45 minutes to an hour north of Atlanta. It’s one of the 20+ golf courses in the Canongate stable, of which I’m a member. 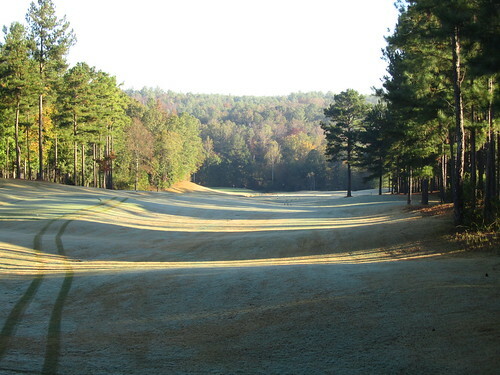 I’ve played here about a dozen times, and consider it our home course. Also it’s very female-friendly, with reasonable chances for par from the Red tees, and two on-course restrooms. My wife has joined me here about 8-10 times, and she is a big fan too. 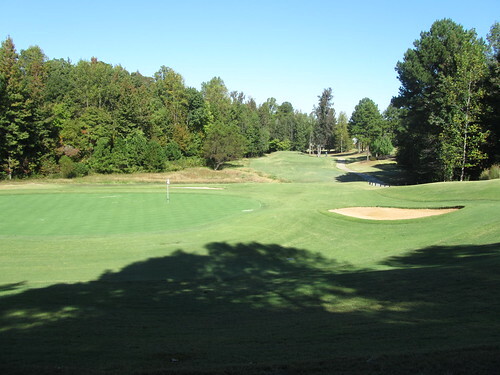 Playing from the Blues, Bentwater measures 6,517 yards, which is definitely in the wheelhouse. Golds are 6,869. I’ve played them once, but found the course more enjoyable for my game at the Blue tees, so that’s where the measurements will come from. The layout of the course is well done. 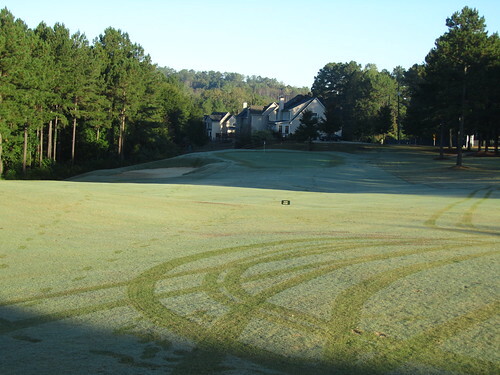 After you park and put your clubs on a cart, you can drive to the pro shop and check-in, then down the hill to the range. 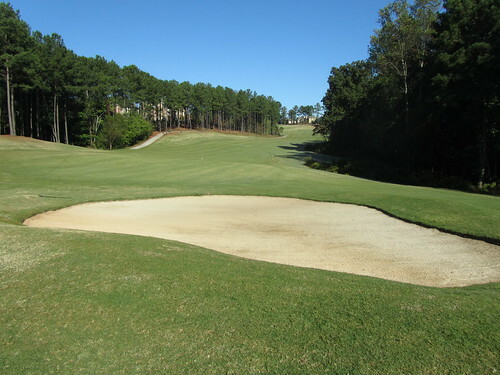 At the end of the range is a short-game area, with a bunker and chipping green. 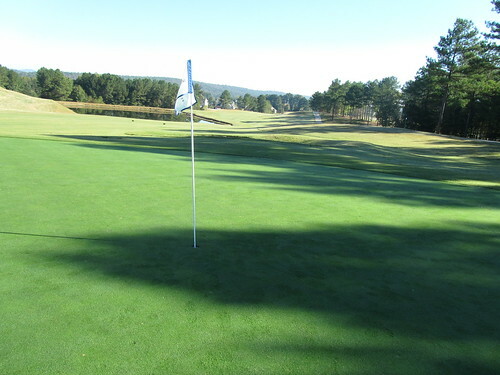 After a few chips, head back up the hill to the practice putting green, directly adjacent to the first tee. If done correctly, all three can be done is a half hour or less, and you’re ready to go! 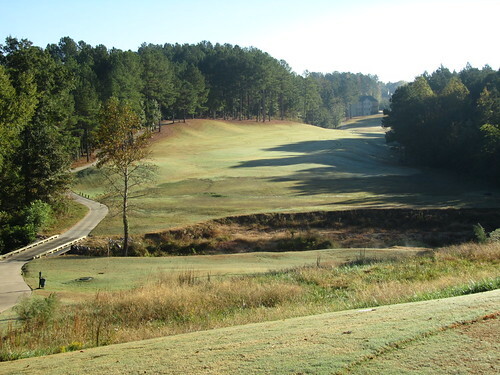 Bentwater Golf Club starts with a 546 yard par 5, with an elevated tee shot. The right is OB (as it’s the backyard of a number of on-course homes), and the left is also trouble, with a large bunker and a sloping fairway. Think accuracy over distance here! Your second shot will most likely be a lay-up to a comfortable distance. I normally hit a hybrid here, and it’s more often than not the right choice. 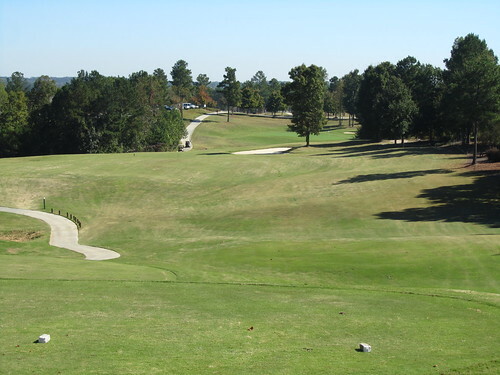 Your approach should be 110-125 to a green with a large hump in the middle. 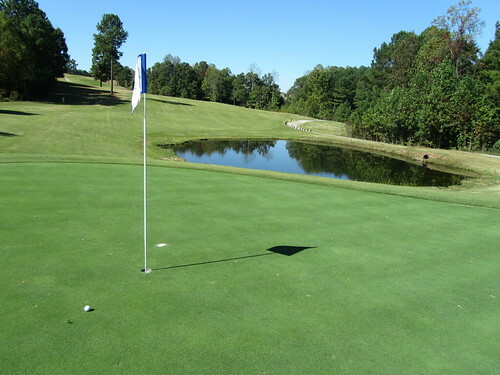 Review the pin position, and get it close for a birdie opportunity. 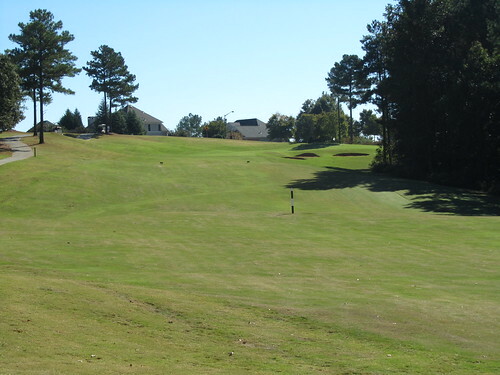 The second is a 383-yard par 4 that plays completely downhill. If played correctly, this is a potential birdie hole. I use a 3-wood off the tee for two reasons; it leaves me with about 140-150 for an approach, and it also keeps me from hitting it too far. 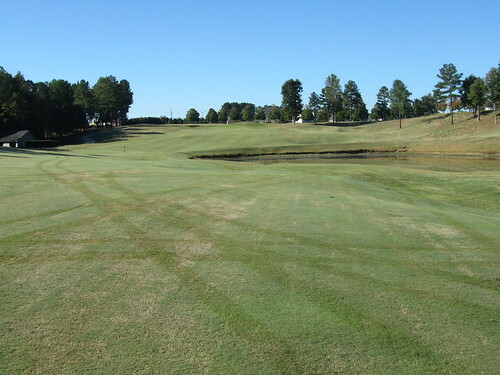 Starting at about 140 yards out, there is a small creek that runs up the left side of the fairway, and hitting a driver unnecessarily brings this into play. You can’t see it from the tee but trust me; it’s there. Your approach will be downhill, so use one less club. Also, better short than long here, as the green backs up to another, larger creek. 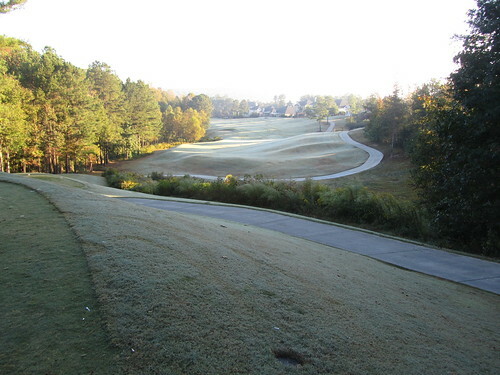 Here’s a shot from green to tee; it shows the downhill slope as well as the creek running through the fairway. 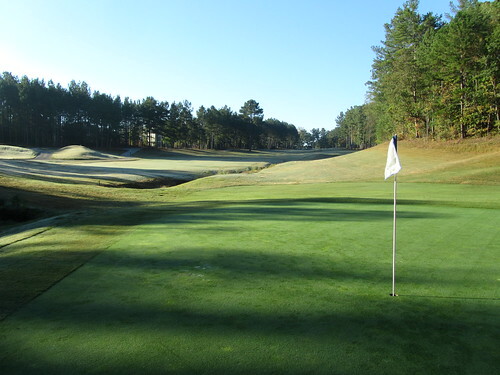 The third is a wonderful risk/reward hole, which is mostly reward if your short game is on. It’s a par 4 measuring only 291 yards and yes, you can go for it with driver and possibly reach it. There is a large bunker in front of the green, and a river running up the left side but for the most part, it’s pretty open. If you’re on with the driver, let it fly! 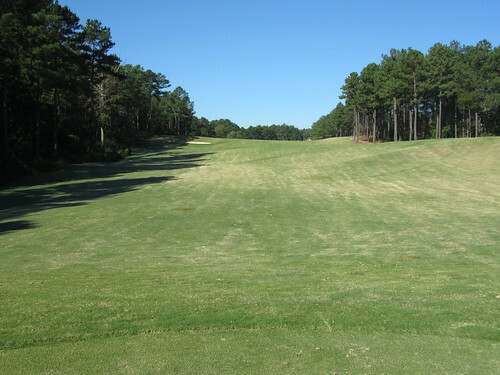 I usually tee off with a hybrid, leaving myself about 85-90 yards, which is a perfect lob wedge for me. 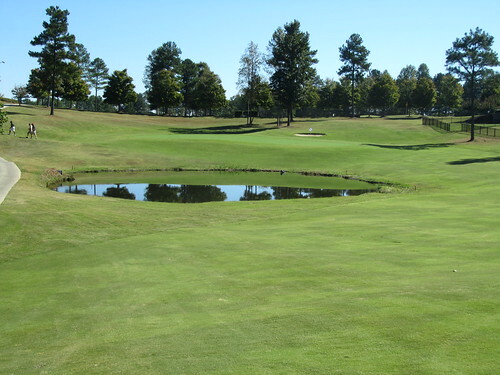 This is also a potential birdie hole (two of the first three holes), so try to take advantage if you can! Here’s a picture from about 125 yards out, showing the placement of the bunker. The fourth is a straightforward par 3, measuring 169 yards. One word of caution; if the flag is on the far left side of the green (behind the bunker) it requires a perfect shot to stick the green. Feel free to bail to the right of it; although it will give you a challenging putt, it should help you avoid taking a big number here. The fifth hole is tough, and when I say tough, I’m not joking. In the dozen times I’ve played here, I’ve yet to par this hole. It’s a 430 yard par 4, and the #1 handicap hole on the course. 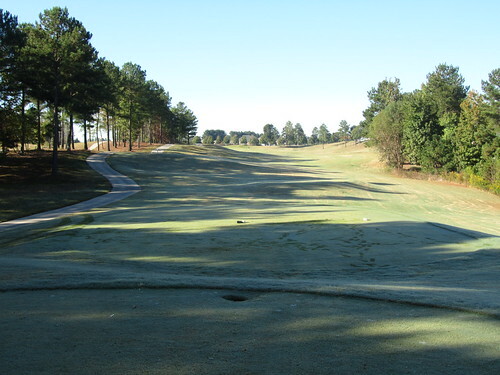 The elevated tee shot is over a chasm, and the safe play is to the left as the entire fairway slopes left to right. The right side of the fairway falls off dramatically to OB, so better left than right for sure. 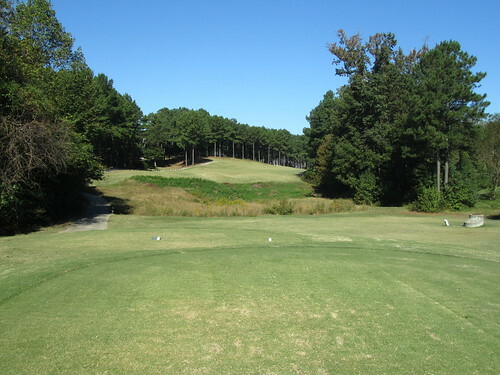 For me, a well-struck tee shot will still leave me with about 180 yards to a two-tiered green. The lie is always sloping to the right, so be wary that the ball flight is going to change. There is also another small creek running between the fairway and the green. I’ve seen smarter golfers play this as a par 5 from the tee. They play hybrid, iron, wedge and 2-putt for bogey consistently. It gives them a slim chance for par, but also removes double bogey or worse from the table. Considering I’ve never parred this hole, I think I’ll try it next time. 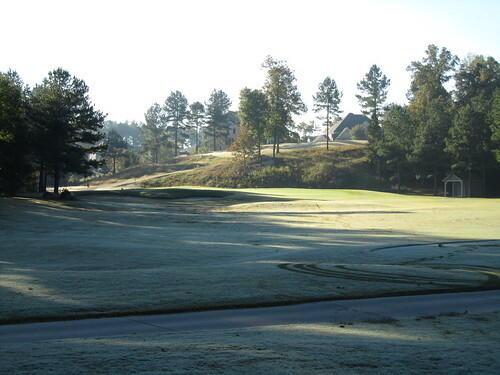 The sixth is a 383 yard par 4 that doglegs slightly to the left. If you play a fade (like I do) the shot from the tee is to hit it directly over the lone pine tree on the left side. This should leave you with a relatively flat lie, and only about 130 or so for an approach. This is another potential birdie hole. Also, the green has a large ridge on the right that forces everything remotely close to roll left so be aware as you align your approach. The approach should be 110-120, but with an uphill lie and the hole uphill, you may need to take more. I’ve never hit it long on this hole so don’t be afraid to be aggressive. The odds are it will be left short. The flag in the following photo is directly over the bunkers; another reason to hit a solid shot. The ninth is a 519-yard par 5. Like the first hole, I’ve never had a viable opportunity to go for either of these par 5’s in two, so it’s all about setting up for the approach. Luckily the fairway is very wide here, so feel free to give it a little more if needed. 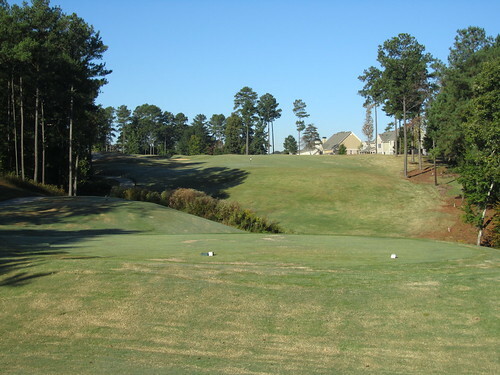 The second shot may or may not have to carry some water, depending on how far right your tee shot is in the fairway. Either way, I usually hit hybrid here, leaving myself about 100-110 to the green. 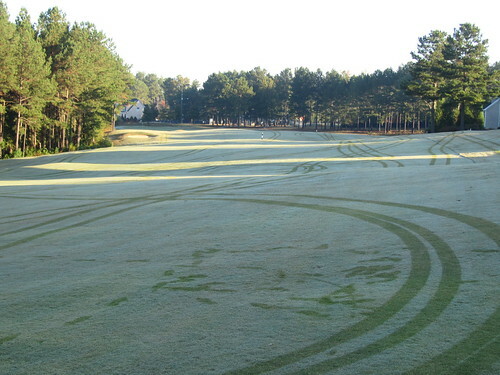 Again, with an uphill approach to a blind green, don’t be afraid to hit it a bit long. The green is large, and there’s lots of room on all sides so be aggressive and you’ll probably be rewarded. Here’s a shot of the green looking back towards the tee. The tenth is another par 5, but this one measures 560. 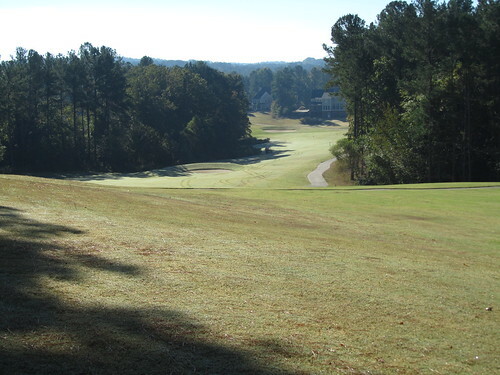 The tee shot is very elevated, so prepare yourself for a great view. There is a bunker in the middle of the fairway that’s reachable to the longest of hitters (or the perfectly struck shot). I’ve only hit into it once, so don’t be afraid to give it a strong hit. Be wary that the right is trouble, and the rough left is pretty tough to get a solid hit from; again better to be accurate than long, as you won’t be going for it in two anyway. Your second will be a layup for your third. Keep in mind that the green is around a corner, so better to hit it a little long than short here. Your approach is to a green contoured like a turtle shell, and anything short and to the left makes for a very difficult up and down. Don’t be afraid to bail long or to the right. Here’s a view from the bunker in front of the green looking back towards the tee; great views here! The eleventh is another potential birdie hole. Measuring 128 from the Blues, this par 3 is the easiest hole on the course. The green is relatively flat and very receptive. Also, the surrounding trees have a tendency to block out the wind, making this a great wedge shot. 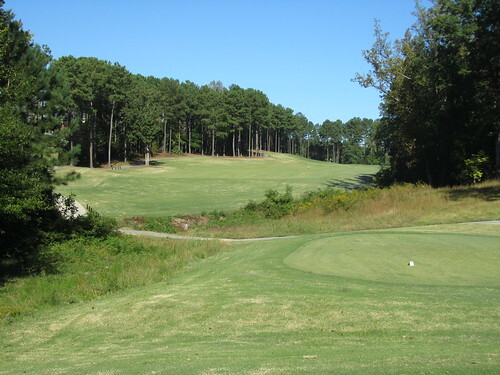 The twelfth is a 418 yard par 4, with an uphill tee shot. Clearing the hill is somewhat of an accomplishment here! 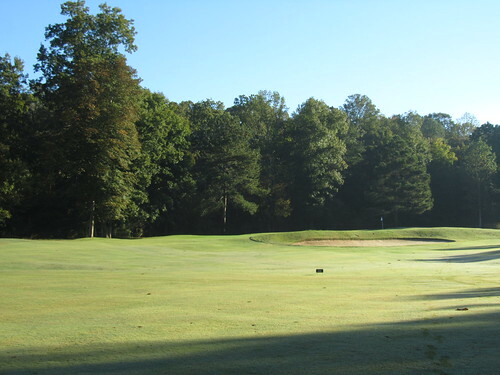 Thirteen is a potential birdie hole with a good tee shot. 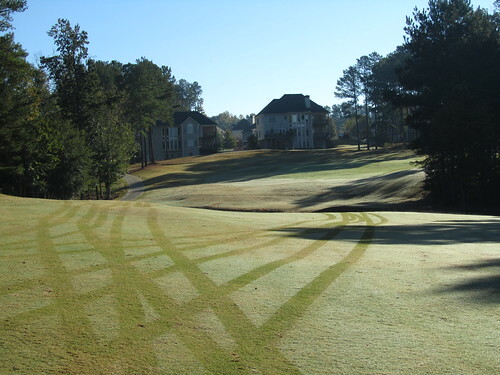 A well-struck drive should leave you with only 100-120 yards to the green. 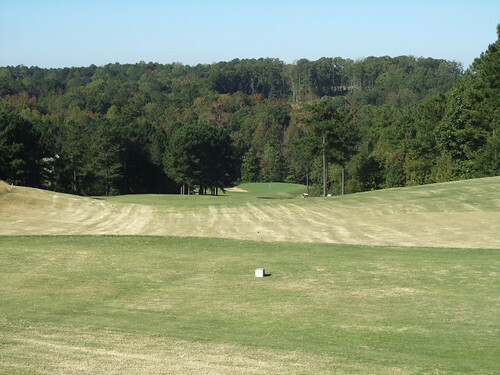 The fairway slopes from left to right so aim it at the left edge and let it fly. 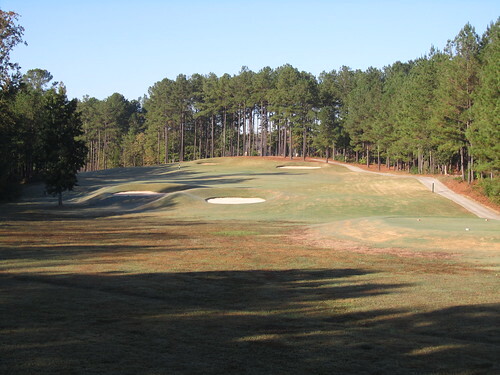 The green is surrounded with trouble, with a bunker left, creek right, and a steep slope behind it. Luckily the green’s larger than most, so if you’re feeling good about your long irons/hybrid, go for it! Fifteen is very much like thirteen; a potential birdie hole with a good drive. 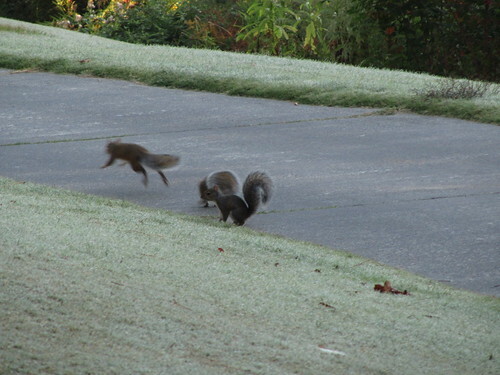 They also both dogleg slightly to the right, and both have trouble right. 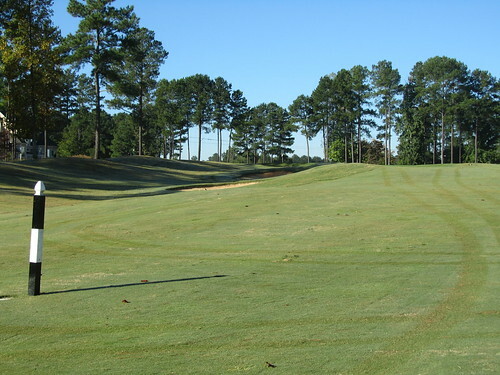 Aim towards the left edge of the fairway and let the slope bring the ball to the middle and you should be rewarded with a wedge approach to a relatively flat green. 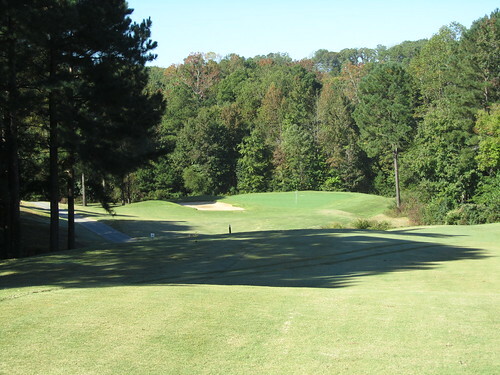 Sixteen is a 175 yard par three, but it plays slightly uphill and into the wind, so take an extra club here. There’s also a large bunker in front of the green and nothing behind it so better a little long than short. Seventeen is a 403 yard par 4. Play your tee shot to the left; the right side is all bunkers, and then it’s all OB. Also, the hole doglegs right, and the approach is severely uphill, so the further left your tee shot, the better your approach. The approach is 1.5-2 clubs uphill, and usually over a few bunkers. If you look closely, the flag is behind the bunker on the right. There’s lots of room behind the green so again, better a bit long than short. The course finishes on a 378-yard par 4. I usually screw this hole up; there are so many opportunities for error (at least for me.) 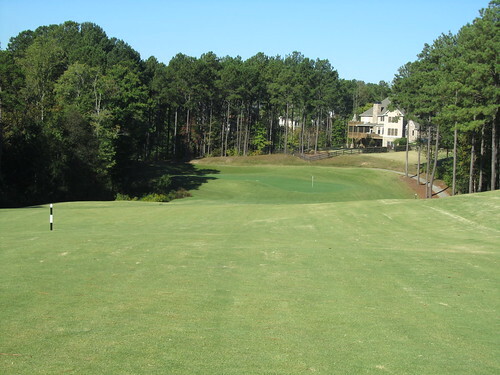 The goal is to land at or near the 150 yard marker (visible in the image below). Note there’s a large tree up the right, a bunker, and houses further right. There’s lots of room left, but beware on going too long. 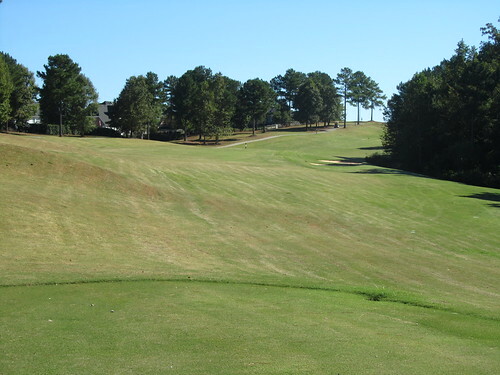 If hit too hard, the ball could trickle down the hill (near the middle and middle left) and roll into trouble. If hit a bit longer than the 150, you’ll be left with a downhill lie, which can be good or bad depending on skill (for me it’s usually bad.) The approach needs to carry a small pond; again, note from the picture below that there’s lots of room long, so better long than short here too. 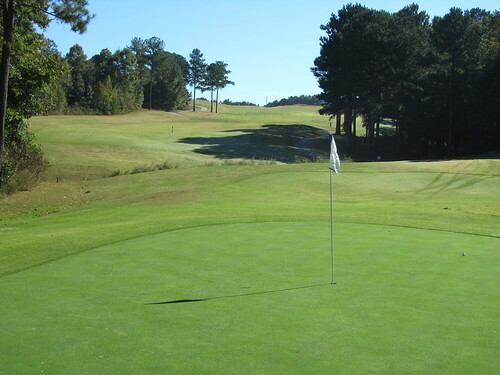 Bentwater Golf Club offers plenty of birdie opportunity holes, but also a number of holes where the smart play is bogey. I enjoy the views, the challenge, and the conditions are usually exceptional. As I said, it’s part of Canongate and for the most part private, but if you ever get a chance to play it (or you’re a Canongate member at a different course), it’s definitely worth the trip.